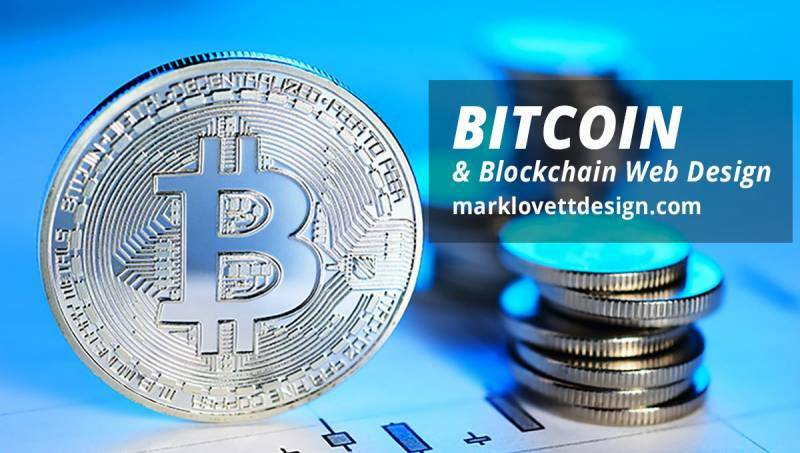 The first step in determining how to best implement bitcoin and blockchain technology in WordPress web design is to study the currently available applications. No sense in reinventing the wheel. We’ll make custom changes to existing applications where needed. Let’s first have a look at themes. Many themes can become great cryptocurrency websites with the right plugins and a little elbow grease. I chose the below themes because they are already tightly focused on cryptocurrency. 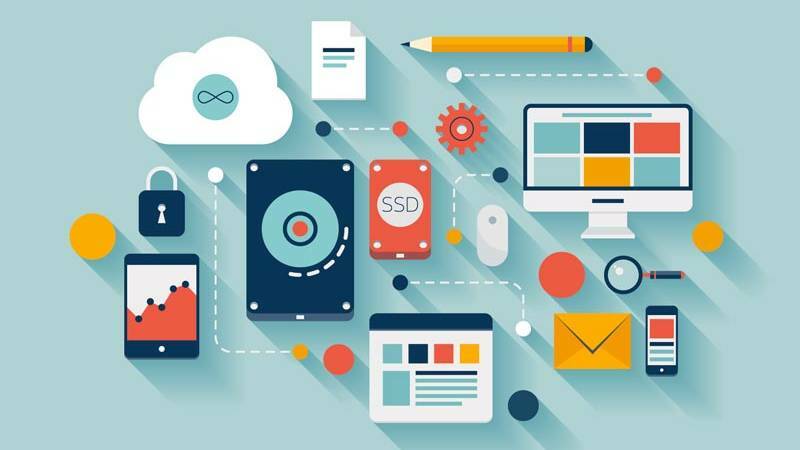 Some of the criteria considered is design appearance, built-in cryptocurrency features, pre-built cryptocurrency content, sales, reviews and comments. 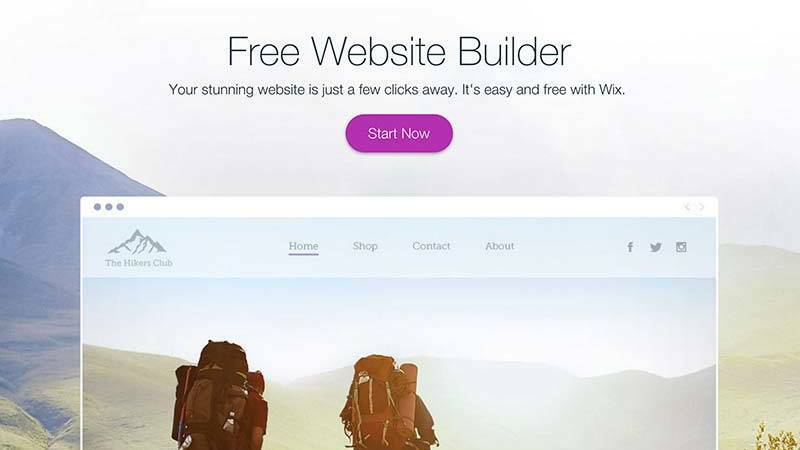 All themes have drag & drop page builders, and are well suited for novice web designers or bloggers to create their own content and design customizations. These premium themes are rather bloated with all the bells and whistles which can be challenging to keep page load times fast. Another option is to choose a more nimble and fast loading theme, using only the plugins needed. We will address this in the plugin section below. 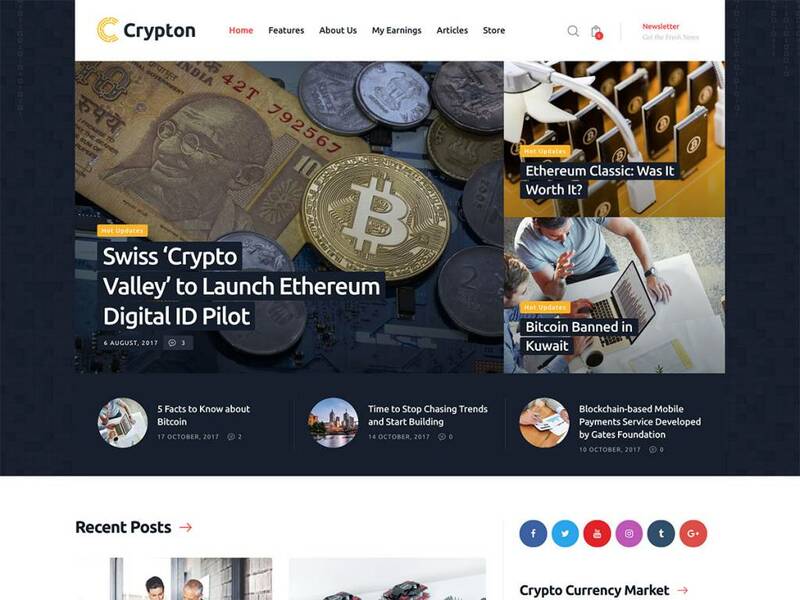 Crypton is a multi-purpose cryptocurrency WordPress theme with four different website demos 1) cryptocurrency blog 2) online magazine 3) cryptocurrency ecommerce store or 4) cryptocurrency coaching website. The magazine demo is for those publishing content at high frequency or working with multiple writers. The coaching demo is for cryptocurrency courses and training products. It has a membership area to your site where your visitors can use integrated features to book a coaching call with you to learn more about cryptocurrencies. The ecommerce demo is for selling cryptocurrency products, such as hardware wallets and computer hardware for mining rigs. These demos include the ecommerce functionality needed to accept payments in Bitcoin and other cryptocurrencies of your choice. 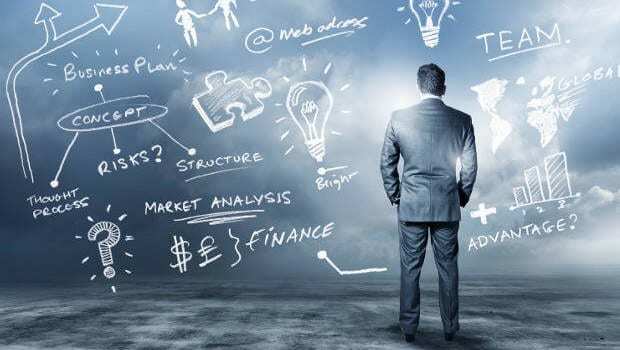 Cryptic theme boasts they have the most sales, over 700, and provides pre-packaged homepages layouts for promoting crypto coaching services, launching an initial coin offering (ICO) opportunity, and building a general purpose cryptocurrency website such as an online industry magazine or blog about cryptocurrencies. 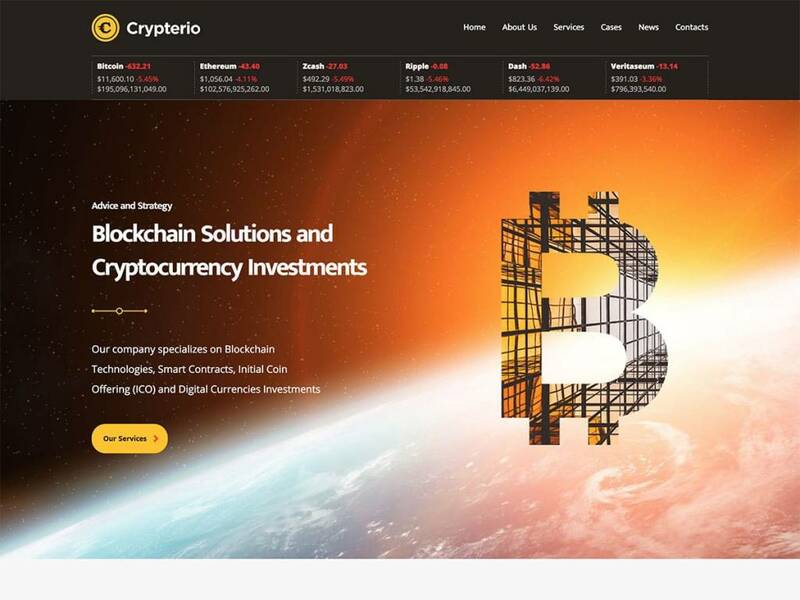 Three main Crypterio website demos provide options such as cryptocurrency advisory services, blockchain consulting, or promoting some other kind of cryptocurrency venture or opportunity. 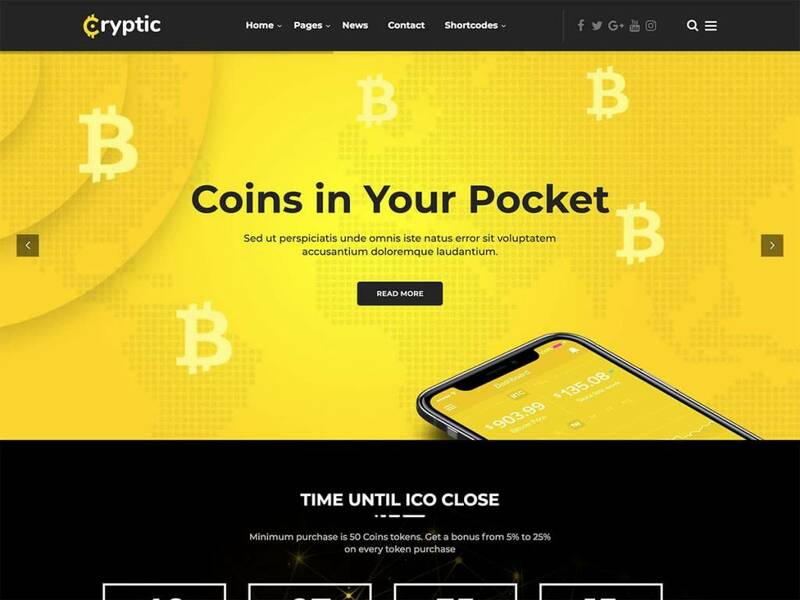 Some of the useful features in the Crypterio theme include advanced countdown timers to help promote your ICO launch, exchange rate widgets to make it easy for your visitors to see how their cryptocurrency holdings are performing, and a cryptocurrency converter tool that should increase the chances of your visitors bookmarking your page as a useful resource. 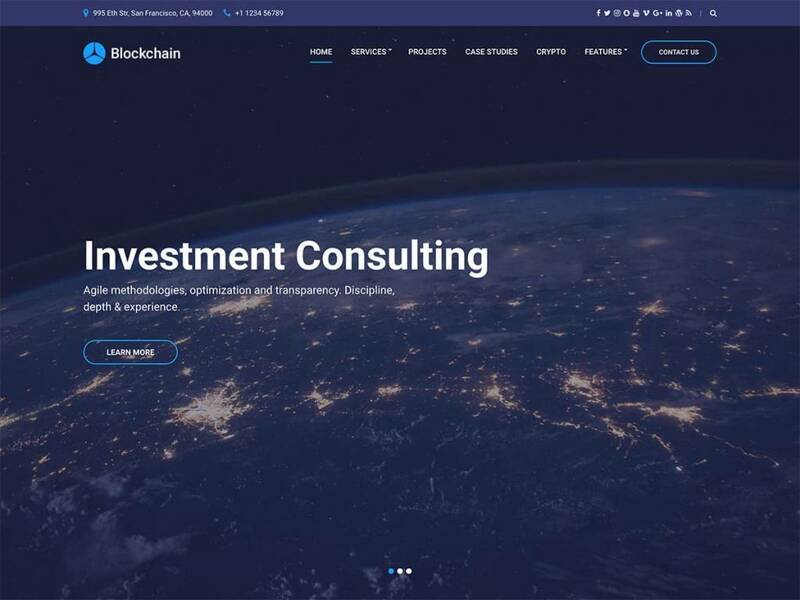 Blockchain is a business WordPress theme, created by the CSSIgniter team, for cryptocurrency and ICO (Initial Coin Offering) related websites. In addition to the features you’d expect to find in a leading business WordPress theme, it has a cryptocurrency exchange rate tool, powered by coinmarketcap.com, that provides an easy way to display the latest exchange rates in a table format on your website. It also has some custom widgets to display the latest exchange rates in the sidebars, footers, and other widget-ready areas of your website. Visitors can see at a glance the values of a range of fiat currencies or other coins. Blockchain theme gives drag-and-drop page builder tool choice of Elementor or Divi to customize demo content or design layouts from scratch. Cant find any reviews for the theme. 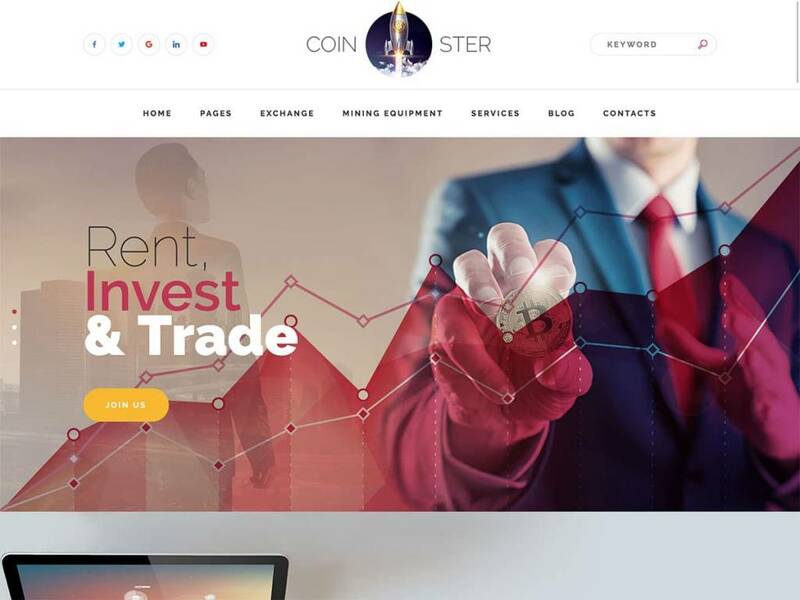 Coinster offers some pre-built content which covers the main types of cryptocurrency websites, with templates for displaying a cryptocurrency exchange, listing mining equipment, and promoting crypto-focused services to your audience. There’s also a full set of blog templates to create a cryptocurrency blog with WordPress. 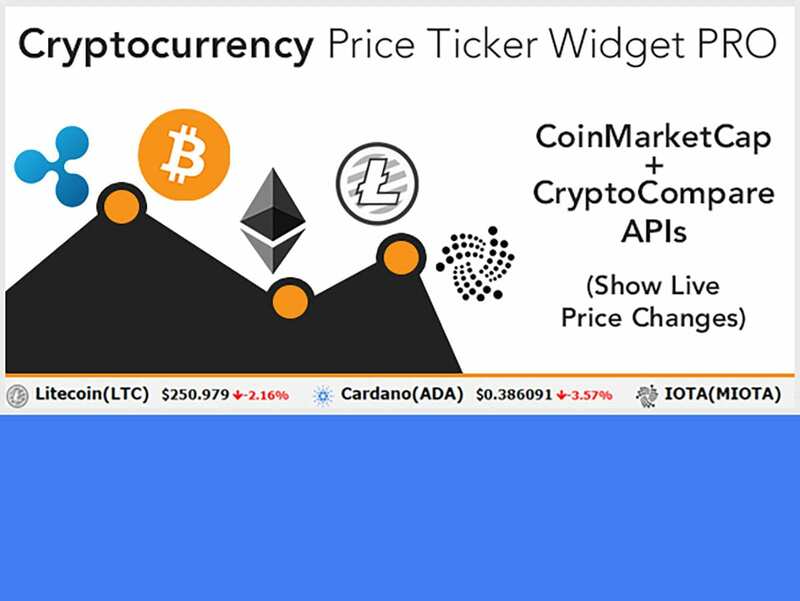 Cryptocurrency Price Ticker Widget PRO displays crypto coins current prices, changes, market cap, volume, coin charts & realtime updates – bitcoin, ripple, litecoin, ethereum, dash, tron & 100+ more top coins. Can display crypto widget anywhere using simple shortcode. This cypto plugin uses COINMARKETCAP & COINCAP.io apis to show current market prices of virtual coins by grabbing data from major crypto exchanges in fastest way. Premium Cryptocurrency Widgets is promoted as the best-selling and top ranked plugin in the cryptocurrencies space. It allows you to easily add various types of widgets to your website and display real-time coins data. A variety of templates and color styles are available to choose from. 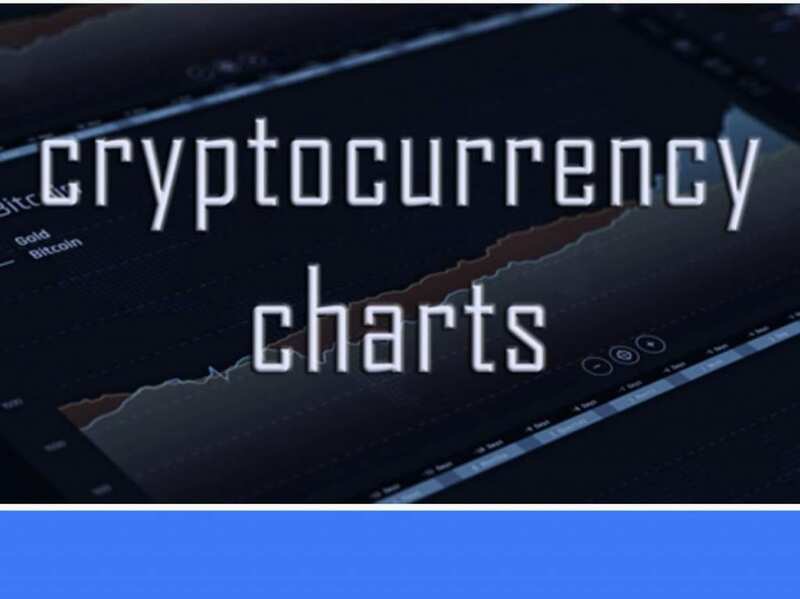 Cryptocurrency Charts for WordPress plugin allows to easily embed fully customizable interactive cryptocurrency charts into a WordPress website. Very nice looking interactive charts! More than 2000 cryptocurrencies, including but not limited to Bitcoin, Ethereum, Litecoin, Monero, Ripple, Dogecoin, Dash, Zcash, Waves and many others. Historical cryptocurrency quotes can be converted and displayed in almost any major fiat currency, including EUR, GBP, CHF, AUD, CAD, CNY, JPY, HKD, SEK, RUB and others. Displays intraday data with 15 minutes intervals. Historical performance of all coins can be compared against each other. Display settings of the chart can be customized to a greatest degree. Background logo images are provided for each cryptocurrency. Trading volume is additionally displayed for each coin. FAT Coincap plugin allow you to easily create live cryptocurrency shortcode and show up anywhere on your site. 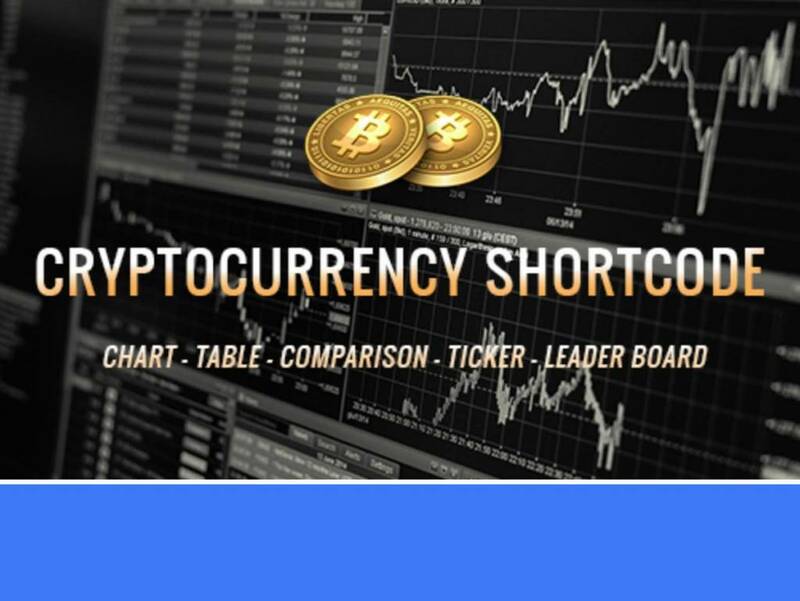 CryptoWP provides real-time streaming charts, cryptocurrency news and offers a set of financial tools covering a wide variety of global and local financial instruments. Embed Bitcoin, Ripple, Etherium and all other crytocurrencies to your WordPress easily! You can create a web site like coinmarketcap.com on WordPress with one click! Support all cryptocurrencies, they are currently more than 1,000. I feel a little stupid having a cryptocurrency blog for over 6 months and not realizing there were cryptocurrency specific WordPress themes! There’s another great WordPress plug-in that you didn’t mention called SteemPress. It lets users crossposting their content to the Steem blockchain, which is pretty cool. I use it on my blog which is still under development but getting better every day.